Interview by Geoffrey Howe CEO of Howe & Howe Technologies. Howe and Howe Technologies we design build and fabricate vehicles that have never before been made with the purpose of helping save lives. Created by Geoffrey Howe and Mike Howe est. 2001. -How much do you think sell Ripsaw EV2 Tank this year in 2016 ? Are there countries more enthusiasm for this new engin ? Can not disclose the exact number of Ripsaw Ev2's but under 10 units sold world wide. Yes countries with hot desert or wilderness like terrain. -Can you tell us few words about the different models of Ripsaw Tank and price range ? All Ripsaw EV2 are custom in many different ways. The machines are built to suite each clients needs. Help change the world with innovative technology and design. Tired of sports cars, yachts and private jets? Want to surprise everyone and take ownership of the road once and for all? It seems that the Howe twins have prepared something for you: the first luxury tank for private use. Maybe you know the Howe brothers through their Black Ops Brothers show on the Discovery Channel, where they have some of their amazing motorized inventions. This time, they decided to take a super fast tank, the Ripsaw EV2 Tank, originally intended for military and customize it according to buyers' wishes for private use. Performance, speed and luxury could be enough to set the Ripsaw EV2 Tank. Developed for the general public for the purpose of off-road use, it takes about 6 months to manufacture one of the amazing machines of this limited series. Depending on the degree of customization, you have to spend 295,000 dollars or more to own one. With its menacing look and sound absolutely amazing to its engine, the Ripsaw EV2 Tank is the first luxury tank too fast, maneuverable, with enclosed cab, which no snowy road or silted not resist. But that hides the Ripsaw EV2 Tank under its "body" in aerospace aluminum? This model two passengers and named "Extreme vehicle 2" has first of all a Duramax diesel engine 6,6L 600 hp, coupled to an Allison automatic transmission that can reach a maximum speed of 96 km / h. But with such a capacity not panic, the tank will hold the distance of 480 km before you need to refuel. The Ripsaw EV2 Tank is impressive in that it is as light as a heavyweight at maximum weight. So it can confront the coast to 75% without any problems. In addition it ensures outstanding stability when cornering, like the greatest sports cars. 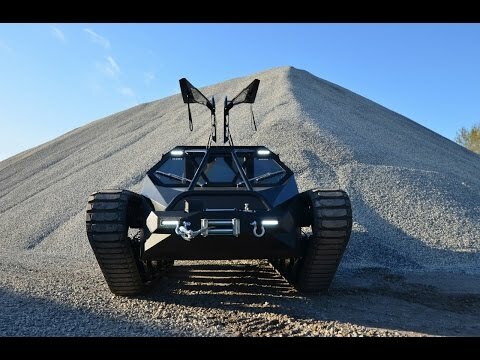 But what happens when you find yourself driving a Ripsaw EV2 Tank? Well you need to take it up in a cockpit that has nothing to envy to other trucks and SUVs and offers the same comfort: leather seats, LCD screen connected to a rear camera (practice without rear windscreen) heating, air conditioning and even a sound system! And if you're not a pro of this type of vehicles do not panic, all maneuvers are electronic and LED lighting night just guide your wheels. But with a Ripsaw EV2 Tank unlikely that other vehicles do not see you coming from afar!